Welcome to my ActiveRain Blog. My goal is to assist you with your real estate needs. By writing about my local area and topics relevant to the real estate industry I hope to provide good and valuable information that will help you get to know me better. And when you are ready for real estate services in Clarksville TN then give me a call or email me. My experience in the real estate industry since I entered this profession in 1980 has taught me that investing in real estate is still the American Dream and can make your life very satisfying and financially comfortable if done right. I am so glad you stopped by to learn more about me and the Clarksville TN Real Estate Market. I use my blog to pass on information about the real estate industry to you my readers and my real estate industry peers. Check out some of my other social media sites. I also want to share with you the many things there are to do in my city, Clarksville TN. When something of interest is happening or when there is a place of interest that warrants a closer look, I will be sharing both of these with you in my posts. Clarksville is a growing city with new things happening all the time. On any given weekend there are many things to catch your interest and keep you busy making you have to decide what to do. It is also a close 40 minute drive to Nashville by way of Interstate 24 making it a commuter town and an extended bedroom community to Music City USA. Since I grew up in Nashville and know it well. I may also be sharing some great finds or places to eat towards Nashville that I have dicovered or that have been recommended. I welcome your comments and look forward to hearing from you. If you don't want to miss any of these secrets of the Northern Middle Tennessee Area, then FOLLOW my blog and you won't miss a thing. If you would like to search for homes in the Clarksville area, then click here and see all available homes on MLS. When I became licensed in Real Estate in 1980. I really never dreamed that I would make this a lifetime career. I got my Boker's license in 1984. Real estate tends to get into your blood and it has become a way of life. It offers so many ways to meet people, help people and provide them with information in making one of the most important decisions of their lives. Seeing them find the right home and realizing their dreams gives me such satisfaction. I love selling real estate and hope it shows. I wouldn't know how to go through one day without talking about real estate. Everywhere I go people like talking about what I do and what is happening in the real estate market. I stay focused on market numbers and trends so I can enter into an informative discussion at a moment's notice. I am known in the community of Clarksville, TN as "The Real Debbie Reynolds". Over the years I have met many relocating buyers and even sold homes for people I had never met. This is why a social media presence is so important and why I focus on being internet savvy. My buyers and sellers appreciate it and it makes looking for homes so much easier. I communicate with my buyers and sellers the way they want to be communicated with, through email, text, phone or in person. I AM NOW WITH CENTURY 21 PLATINUM PROPERTIES, A NAME FAMILIAR TO MILLIONS ACROSS THE UNITED STATES AND ACROSS THE WORLD. IT IS A NAME COMMITTED TO DEDICATION AND SERVICE AND QUALITY AGENTS. My primary goal is to provide the very best real estate services to my clients and have the satisfaction knowing that they are well served. Whether you are wanting to purchase a home, selling the one you have, relocating out of town, buying investment property or needing a place to rent, I will work hard for you to get you the best deal possible and provide you with the answers to your questions and concerns. Over the years I have taught real estate to new agents for more than 30 years and am now one of the instructors is our local Realtor Associations pre-license school called CARES.. Additionally, I really know the ins and outs of real estate, earned numerous designations in the industry, owned my own company for 10 years but now just devote my time and energies to helping people buy and sell real estate and serving my local and state Associations. I have sold thousands of homes (some of the homes I have sold 3 or 4 times over my career) and I was a top producer Prudential Real Estate Network, Berkshire Hathaway HomeServices Networks. Now I am Managing Broker at Century 21 Platinum Properties. Each Century 21 office is independently owned and operated. Happy Clients Make Me Happy, Too. The Century 21 Realty part of the name refers to a nationwide company that has real estate branches in several states and internationally. Believing in the professionalism of being a Realtor and adherring to the Code of Ethics are important to me. I am a member of the National Association of Realtors, Tennessee Realtors and the Clarksville Association of Realtors. I was elected to serve on the Board of Directors of our local Association in 2013 and 2014 serving in the position of Treasurer. I also serve as a State Director for years 2013 and 2014, 2016, 2017 to Tennessee Realtors which I am totally enjoying. In 2015 I co-chaired the Business and Facilities Committee and served on the Membership, Education and the Finance Committees. I helped facilitate our Tech University that was such a success introducing technology to our REALTORS in 2014 and again in 2015. For 2016 I am served as Vice-President/President Elect of the Clarksville Association of Realtors and in 2017 serve as President..I have been appointed MLS Director for Realtracs (Middle TN MLS Service) for the years 2018 and 2019.. I serve on the Strategic Planning committee and the Business and Facilities Committee. I will continue to serve on the Education and Budget and Finance Committees. Exciting times are ahead and I am really enjoying the involvement. Additionally I am attended Leadership TAR during the year 2016. At the 2015 Awards and Installation Luncheon I was awarded the Decade of Achievement Award. What a wonderful honor to be recognized by my peers. I am a strong believer in continuing education and staying abreast of the changes happening in license laws and the new technology that is constantly hitting the market. In addition to the above, I serve on the Public Relations Committee, Business and Facilites, Education Committees at our Association and Chair the Budget and Finance Committee. For the last year I have served as an Ombudsman to the communty to help resolve situations that might arise between Realtors and the Public. I am continuing to serve in this role. What do I do when not selling real estate? Jack, my husband is in the building business, on the commercial products and installation side of construction. He also builds homes with my contractors license, DOR Construciton. This works quite well integrating with my real estate business. all total we have four grown children, two boys and two girls that have made us proud parents. The girls, Lori and Jessica are moms and have given us four wonderful grandsons. The grandsons all live in Clarksville TN so we are blessed to have them close by where we can stop by to get a hug whenever we want one. 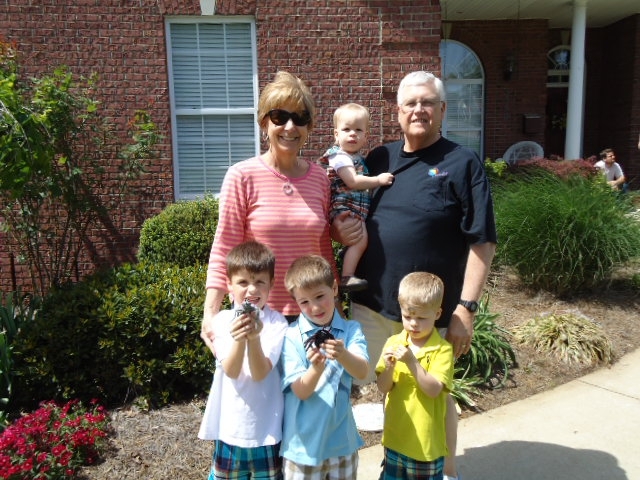 We also love having the grandchildren come to our house and call us "Memaw and Pappy". Richard and John are good sons-in-law and work in and around Clarksville. Our oldest Son, Jackson, lives in the Franklin TN area. In his spare time he works in the film industry writing and producing films and this really is his love. You may see his name in lights one day as he is quite talented in his field. Our youngest son,Patrick is in the Navy band and he is an accomplished trombone player. Currently he is station in Virginia Beach, VA and lives near the beach. That makes for a happy son. His wife, Angela is also a talented musician and plays and teaches flute and is currently studying to get her doctorate. They make beautiful music together as the saying goes. My church is First Baptist Church, Clarksville TN and am active in our Sunday School Class where we fellowship with some great people that we love and support. I believe in he mission and support the Fellowship of Christian Athletes (FCA) as an outreach Christian based program that is spreading the word about Jesus and how to play sports drug and alcohol free. My husband and I are TITANS Fans and enjoy going to the games in Nashville. We are also "Peay Nuts" and support and follow Austin Peay State University Athletics especially the football and basketball programs. Speaking of Austin Peay State University, we like to take advantage of the music venues available to the public at the Mass Communication Building. These concerts are spectacular and we fell in love with them when our son was attending college and performing there. For a city our size the music is some of the best in the country. Gardening is one of my favorite things to do but finding time to do it right is difficult with my busy real estate schedule. I also like to read, decorate, write, cook, bake bread and knit and crochet. My husband and I love to explore history together and enjoy traveling. I love photography and love looking at life through the camera lens and then to see it again on the computer and really seeing noticing the little things in the shot. I could spend the whole day taking pictures. Our current project on the "bucket list" is visitng all the Presidential Birthplaces, Homes or Presidential Libraries that we can find. We started this in 2010 and are more than halfway through the list. Each year we take in a few more.It is such fun to learn about the behind the scenes makings of these men that influenced our country's history and where we are today. We are about 2/3's of the way through the list. Clarksville has some beautiful historic buildings and that works out well to help satisfy my interest in our rich local history and gives me plenty of opportunities for taking some great photography. So what does all this have to do with You? Experience, relationships and knowing the ropes makes your real estate transaction more seamless and smooth. When you have me working for you, you are getting the best representation in negotiating and sound, proven market advice. Most of my clients refer family and friends to me because they were pleased with the service they received. And I am doubly pleased that they feel like they can trust me to do the same good job again and again. That's what it is all about. Doing it time and time again and making an impact on the local market in a positive way for the good of my clients. Learning and staying informed abut the real estate industry is evidence by the AHWD, CRS, E-PRO, GRI, SFR, MRP designations and certifications that I have earned through the National Association of Realtors. In 2012 I added the ePro Designation which focuses and concentrates on marketing through social media. Social media is the way of today and the future possibilities with it are endless. I can't imagine trying to market and sell real estate, reaching people, connecting, and staying in touch without the social media connections. I have also completed the GREEN Designation that focuses on those areas that are so much in the news about being Eco-friendly and not hurting our environment. It seems that many of my buyers are concerned with GREEN building and recycling so now I have the knowledge to guide those buyers to better decisions on how to be GREEN. I want to be the best I can be for my clients and that means staying connected and in the know of the latest trends and ideas in the marketplace. In 2014 I attended the course and received the (MRP) MMilitary Relocation Professional Certification and will use what I learned to better serve my relocating military buyers. I also earned the AHWD, At Home With Diversity Certification that is training to understand how to treat all buyers from different cultures and situations. I have also been a member of the National Association of Home Builders I have received the CSP Designation which is a specialty knowing how to sell new homes.On my websiteyoucan learn more about me and search through all the homes available in the market of Clarksville TN and surrounding areas. Click on my personal website to begin your home search now. You can also find market data on neighborhoods, schools and points of interests. My Outside Blog is Real Estate by Debbie Reynolds and follows my AcitveRain blog. Also check out my videos on my YouTube Channel under debbreynoldsrealestate and Like It. I try to change it up a bit so you will see helpful tips, home tours, point of interest in Clarksville, Market Reports and also good places to eat. I hope to never make you bored and hope you will come back again and again. Follow me on social media channels and I would love to follow you too. I have earned many designations and certifications through the National Association of Realtors. ABR- Accredited Buyer's Representative and serves the needs of today's buyer with giving the buyer representation in the real estate transaction. As an ABR agent I advocate and advise the client guiding the client to make good decisions in the buying process. AHWD- At Home With Diversity is a certification I have earned through the National Association of Realtors. Clarksville TN has a diverse population with our international industries and our close association with Fort Campbell Military Installation and their families. Being aware of the needs of many nationalities and cultures is what a good real estate agent does and it is crucial that all people are treated with respect, fairly and get full services. CRB- Council of Real Estate Brokerage Managers. This focuses on better real estate management principles and how to run your business more efficiently. Since I owned my business for ten years I can understand the other side of the real estate brokerage. CRS-Certified Residential Specialist- First time home buyers also find that buying a home can be fun and easy because I lay out the process on the front end so they know what to expect along the way. That way they look forward to making the home their home and how they will enjoy it with no worries of what happens next. My ABR and CRS designations show that I have learned valuable information about the homeselling and homebuying markets and have the tools to help buyers purchase their first homes. ePro-This Certification is the internet specialist designation given by the National Association of Realtors. What I didn't know is just how much there is to know about the changes in technology and the internet. Since I have been blogging regularly I have been exposed to a lot of the terms and resources available. But we new things coming online every week, it pays to focus specifically on this important part of the real estate industry. Also with the new designation coming, those people that know what it means will recognize a certain expertise in the field of technology and e-business. GREEN- I now have my Green Designation given by the National Association of Realtors This specialization will help me understand about green building products, environment and how homes and home buying are being affected by the government changes. Be looking for more letters after my name as I strive to stay current with knowledge and information that will help me better serve my clients and customers. GRI- Graduate of Realtors Institute has given me a foundation of learning about what the real estate business is all about and how I can use that knowledge to better serve my buyers and sellers. MRP- Military Relocation Professional is a certification given by the National Association of Realtors. Living in a military town with Fort Campbell a vital part of our community it is important to be on top of the needs associated with the relocating military families. This training better equips me to respond to the needs of the military as they buy, sell, rent and lease out their homes in the Clarksville TN area. SFR- Short Sales and Foreclosure Certification -Many years ago I started working with banks and lenders helping them sell their troubled properties. Throughout the years I aa have gained a tremendous amount of knowledge that helps me sell these properties to investors and owner occupants. Not all foreclosures are good deals so to learn the in's and out's buyers come to me for the secrets on finding the best properties. My SFR designation gives me the credentials to know the tricks of the trade. I also have a checklist available for these buyers telling them how to make their offer shine in the best light to the banks so they win. Senior Real Estate Specialist (SRES) Designation - Selling in the senior market takes a special understanding of the needs of this clients base. This specialty enables me to work hand in hand with these buyers and sellers in making one of the most important decision of their lives. Learn more about my certifications on my website and/or search for your new home. My Market Area includes all of Montgomery County and into the edges of Cheatham, Robertson and Stewart Counties. I can also help you with some areas of Davidson and Sumner Counties as I grew up there and know the turf. Served as State Director to Tennessee Association of Realtors 2013, 2014, 2016, 2017. Learn more about Clarksville Association of Realtors here. I work well with first time homebuyers, investors and relocating buyers and sellers. Having been a trainer for many years I know how to communicate well with the clients and customers, negotiate and streamline the buying and selling processes. If a buyer would like to build a home, I can offer years of experience of working in new construction (I even have a contractor's license) and know what I am doing. Having been involved in development and the building of hundreds of homes, I can simplify the steps and make homebuilding a fun experience. I have sold thousands of homes in all price ranges and can help you too. Get more details about my sales history and how I can help you. Thanks again for helping me get an incredibly good deal on an investment house. I have some great plans to turn it into a small rental house and you are helping me with my retirement planning. Keep your eyes open for another one. Debbie, Thank you for showing us the house you sold us. It is just right and there are so many things we like about it. We are looking forward to being homeowners in Clarksville. I am so glad you were able to sell my lot and get me a good price. If I had used an agent when buying it I would have chosen you. Thanks and good luck to you. Of course we were going to use you to find a home but never dreamed you would do it so quickly. The home we bought if going to be a great home for a long, long time. You made it happen and helped make the move easier than it could have been. I am glad it worked out and now relocated with my daughter. I am having a great time in Florida. You sold my house much sooner than I thought and allowed me to go ahead and make my move out of state. I forgot how much was involved in selling and glad that you were there to help me through it. We love our new home and think it is so quaint. The colors and style are going to make our furniture look so good. Thank you Debbie for finding us a great investment house. We got it rented at a good price and it looks like it is going to work out so well for us. Thanks for selling another one of our new homes in Farmington Subdivision. We really depend on your expertise and guidance. You sold my house not once but twice and in record time. I am so glad to have you as my agent.